Although much of President Trump's protectionist rhetoric has been directed at Mexico, Canadian leaders are just as worried about what the new U.S. leader's policies will mean for their economy. It’s a cold Thursday morning 583 miles north of Washington, D.C. and about 250 business managers have gathered in a hotel. Quebec has just gone through one of its worst snowstorms in several decades, but some participants have travelled all the way from Quebec City to attend an annual business summit in downtown Montreal. They’re waiting for a specific talk, a sold-out event called “Vision and Outlook on Free Trade Agreements,” which was organized by the Conseil Québécois de la Coopération et de la Mutualité [Quebec Council of Cooperatives] and the Chamber of Commerce of Metropolitan Montreal to help Quebec businesses navigate the uncertain economic climate of 2017. It’s not yet clear what they will be told. The question of free trade has been everywhere since the election of President Trump, whose campaign was founded on protectionism, and no one can be sure what impact his policies will have on Canada. The question of free trade has been everywhere since the election of President Trump, whose campaign was founded on protectionism, and no one can be sure what impact his policies will have on Canada. Supporters of Donald Trump cheer at a campaign rally in Pennsylvania, October 2016. There are questions to be answered about the renegotiation of NAFTA, a border adjustment tax, increased border security, lower corporate taxes on American soil, and relaxed regulations in the energy sector. As business managers are waiting for the talk, the southern neighbor and the direction of its new administration are unsurprisingly on the mind of most in the room. The former premier isn’t sure. Neither is Leroux, who participated in the first official Canadian meeting with President Trump. 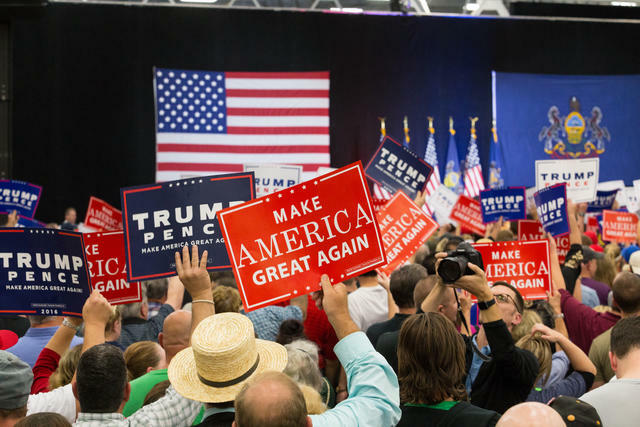 Trump campaigned on some policies that could be damaging to the Canadian economy, such as lowered corporate taxes in the United States that could threaten Canadian competitiveness, and others that could be beneficial, such as an investment in infrastructure. There is particular anxiety about the possibility of a “Buy America Act,” which could throw the economics of the entire continent into disarray. But to date, his plans remain unclear, even to the most experienced and well-connected politicians and economic leaders in Canada. In the business community, there are hopes that the new administration will behave rationally. In the business community, there are hopes that the new administration will behave rationally. Canada and the United States have enjoyed a stable and mutually beneficial commercial relationship since the Canada-U.S. Free Trade Agreement came into force 28 years ago. Every day, almost two billion U.S. dollars’ worth of goods cross the border and facilitated trade and investment led to the creation of about thirteen million jobs in the two countries — nine million in the United States and four in Canada. But while President Trump is polishing his economic strategy, Canadians are grappling with uncertainty, trying to prepare how to best protect their interests and adapt to changing regulations with little idea where the American administration is heading. But while President Trump is polishing his economic strategy, Canadians are grappling with uncertainty, trying to prepare how to best protect their interests and adapt to changing regulations with little idea where the American administration is heading. 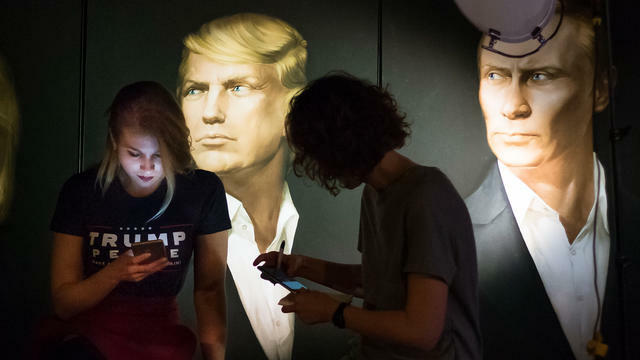 They are carefully monitoring the news and some even read President Trump’s tweets, but aren’t sure if they are really representative of the decisions that will be taken. 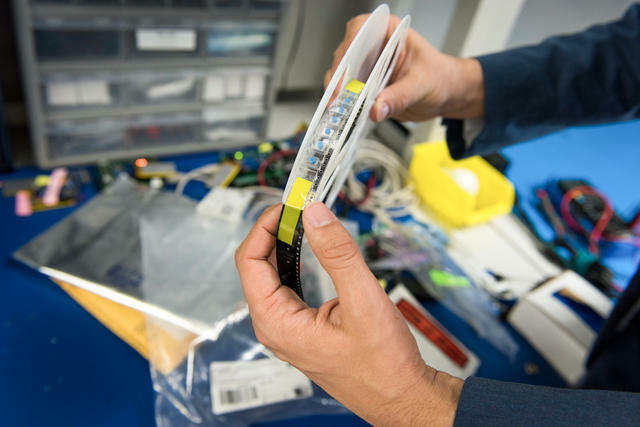 Components of electronic boards are made at Hexoskin, a startup that sells wearable body metrics devices. 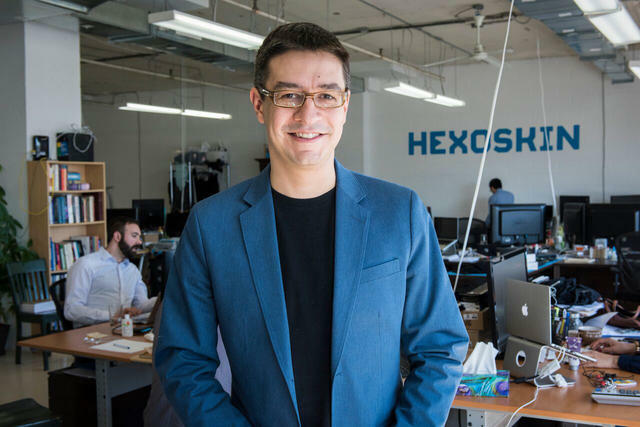 In his office in Montreal, Pierre-Alexandre Fournier, CEO of Hexoskin, an innovative health startup selling wearable body metrics, is waiting to see how he will have to adapt his business strategy. In a large, open space, twenty-five employees are busy working at their computers, some looking at data and programming, others handling sales and marketing. In a nearby room, a workshop is set to test and develop prototypes for future projects. The company, founded in 2006, is in the process of expanding. It is only March, but Fournier expects Hexoskin’s revenues to double this year. The company has thousands of clients in the US, from hospitals and universities to government agencies like the Department of Homeland Security and NASA, and Fournier is watching the political situation closely. The uncertainty is not just on their end. Some of their American clients are hesitating, waiting to see how the president’s proposed budget will transform as it makes its way into law. Fournier has been preparing for years to be easily adaptable, regardless of who was going to be elected in November 2016. The company is well integrated in the U.S., with an office in San Francisco. One of their manufacturers is also on American soil, so depending on the situation, Hexoskin could move some of its production across the border. 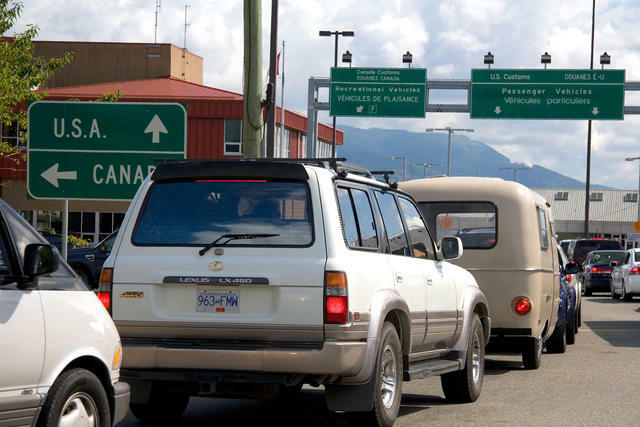 Vehicles queue to cross a road border between Canada and the United States. Hexoskin employees regularly travel to the United States, but the travel ban has raised concern. Some people in the company are dual citizens, sharing citizenship between Canada and a country listed on the travel ban. Fournier is not certain they would able to enter the United States if the law is allowed to take effect. The latest figures from U.S. Customs and Border Protection still show that the total number of Canadian travelers denied entry to the United States between October 2016 and February 2017 dropped. But in recent weeks, Dan Kelly, president of the Canadian Federation of Independent Business (CFIB), has heard about problems from some members trying to visit the United States. Small and medium-sized businesses account for about a quarter of total Canadian exports, and about 90% of their exports go to the United States, putting Kelly at the forefront of these issues. Members of his organization have been reaching out with worries, and he tells them to contact their MPs. “The worst thing for businesses is an unpredictable business environment and it seems like everything about this new administration is moving into the unpredictable category,” says Kelly, whose greatest area of concern is Trump’s apparent protectionist agenda. 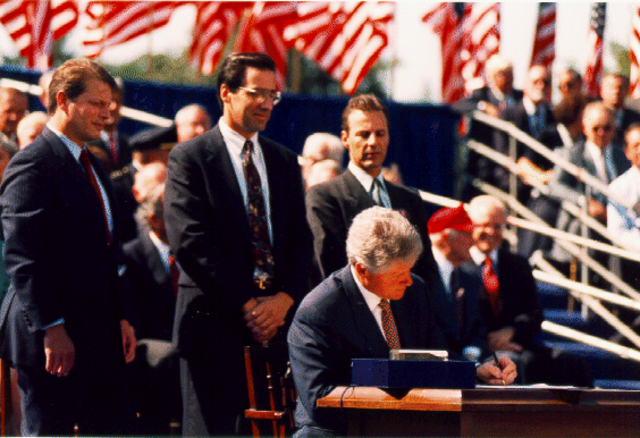 U.S. President Bill Clinton signs NAFTA, November 2013. 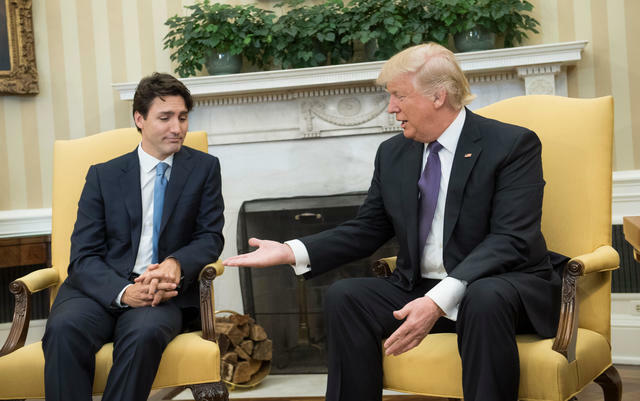 Although Kelly’s organization, the CFIB, is often critical of the government of Prime Minister Justin Trudeau, he feels it is doing “a very good job” in its early handling of the Trump administration, particularly when Trudeau promptly visited the White House after Trump’s inauguration. Prime Minister Trudeau declined to comment on President Trump during the electoral campaign, and their relationship remains a work in progress. Even if the two countries have enjoyed a longstanding friendship, Mr. Trudeau and Mr. Trump’s styles and policies are very different, especially on a number of matters, including immigration and the environment. In January, in his first cabinet shuffle since he came to power, Prime Minister Trudeau seemed to set Canada’s commercial relationship with the United States as a priority when he moved Chrystia Freeland, former international trade minister, to the higher function of foreign affairs minister. Freeland, who handled CETA, the free trade agreement with the European Union, and who, as a former economics journalist, used to live in the United States, was thought to be an asset in future dealings with President Trump. Since the president’s inauguration, Canada’s federal and provincial governments have been proactively trying to establish relationships with their American counterparts, engaging in phone calls, visits to Washington, D.C., and meetings with American business representatives. The Canadian business community was reassured by what seemed like a positive first meeting between Prime Minister Trudeau and President Trump and his team. In the weeks after, the Canadian minister of finance also visited the White House, summing up his visit with comments similar to those made by the Prime Minister about the importance of working together toward creating more opportunities for the middle class on both sides of the border. “We will continue to work closely with the new U.S. administration and with the United States Congress on issues of mutual interest, including trade and investment in various sectors,” said John Babcock, spokesperson for Global Affairs Canada, the government's diplomatic and consular affairs department. At the Montreal Economic Institute, Germain Belzile, a veteran economist, believes the Canadian government’s strategy regarding the United States will have to adapt, given the importance of the commercial issue. Through its network of embassies and consulates spread over the country, Belzile thinks Canada and its provinces could “play their cards well” to be able to negotiate in their favor, especially since most in Canada feel President Trump has suggested in his recent tweets and comments that his protectionist agenda was more specifically targeted at Mexico. 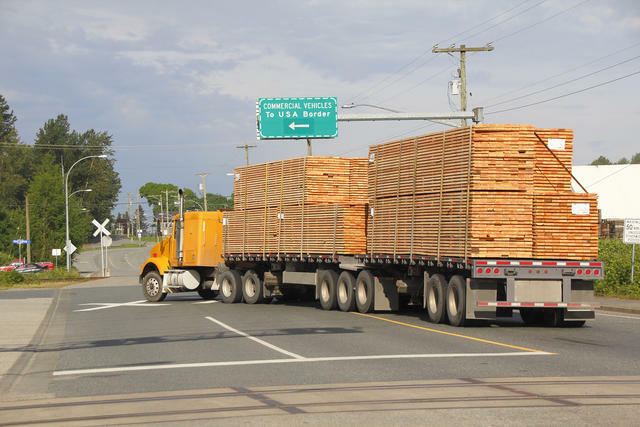 A flatbed truck transporting Canadian lumber approaches the U.S. border. However, in recent weeks, Canadians have been incredibly worried they have miscalculated the situation, as U.S. Secretary of Commerce Wilbur Ross and President Trump have started targeting Canada’s dairy and softwood lumber industries. President Trump also recently announced he was “going to terminate NAFTA,” backing down after a phone call with his Canadian and Mexican counterparts. The Canadian government has been vigorously defending its interests, while trying to prevent a potential trade war with their biggest commercial partner. But the uncertainty persists, because there is a lack of understanding as to how President Trump will function within the wider political system. The stakes are high for Canada. Three quarters of its exports and an estimated four million jobs rely on the relationship with the United States. Canadian businesses have long benefited from having an immense neighbor with similar economic and political characteristics. How will that fare in a new era of “America First”? Clothilde Goujard is a freelance journalist based in Montreal, Canada.